One of the most useful features of Mac OS X is the feature called data detectors, which allow users to highlight text and words to then get instant dictionary definitions, details about movies and other media, and, as we’ll show you here, you can even get data about airplane flights that are coming and going. Just about any identifiable active flight can be seen this way, visible on a hovering map overlay with information about the airline, the status, when it departed, if the flight is delayed, when the flight is arriving, it’s origin, and it’s destination. 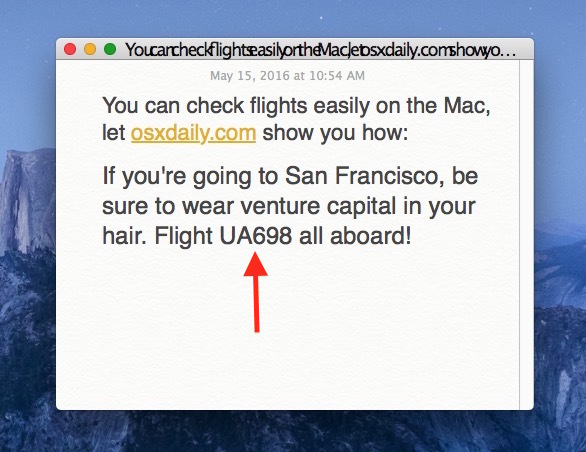 As long as a flight number is available to select, it works just about anywhere in Mac OS X as long as the app has data detector support, whether that’s Safari, Notes, Mail, Pages, Messages, Contacts, and many more. The flight pop-up window is interactive, you can click on the origin and destination airport codes to zoom onto the map where those are (just in case you aren’t certain), and you can also click, drag, zoom in, and zoom out of the little map itself. 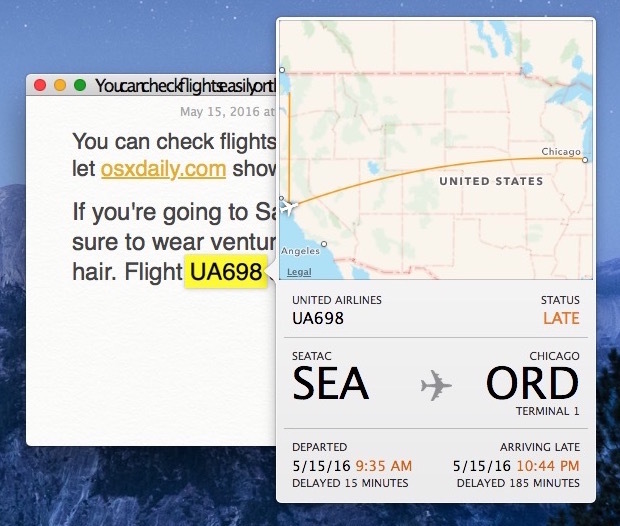 Clicking away from the flight popup will close the flight information window instantly with all airplane details. 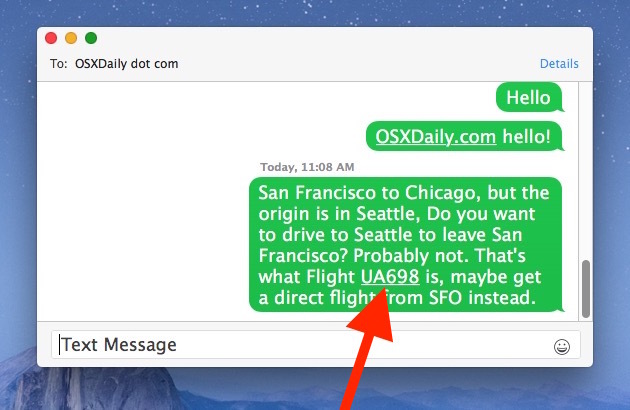 If you want to test this out right now but don’t have anyone coming or going or any email, text message, or a flight number handy, you can use Siri to see flights overhead, and then just type one of those flight numbers into TextEdit, Notes, Messages, Safari, and use the steps outlined above. This is a great feature, and as mentioned as long as the app in use includes data detector support, it should have no problem retrieving the flight information. 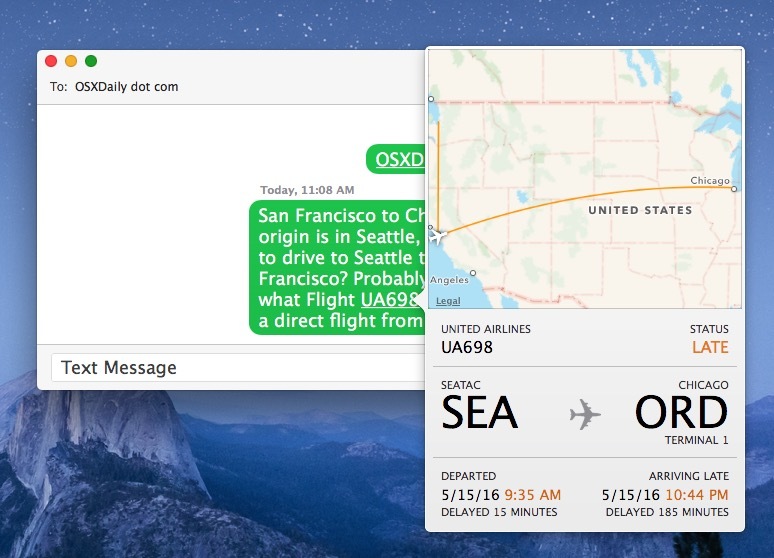 For longtime Mac users, you may recognize that tracking flights through Mail app has been around for ages and it routed through a Dashboard widget, but this expanded ability to get the same plane and flight info from nearly anywhere is much newer. Try this out yourself the next time you’re working with flight information, whether you’re planning a trip, picking someone up or dropping them off at an airport, or just expecting a visitor. It’s quite useful! Great feature. 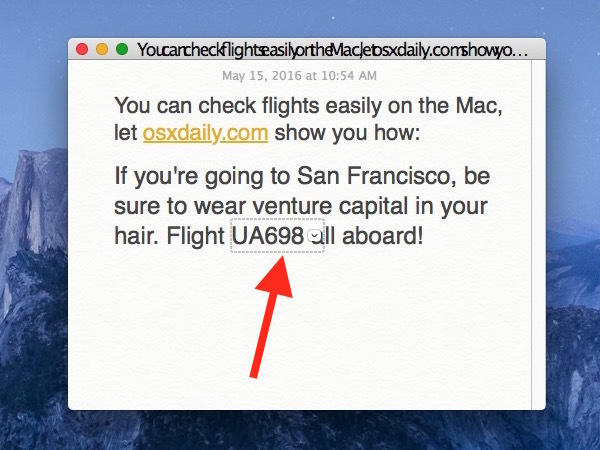 And best of all, it is also available in mobile devices running iOS 9.0 or later wherever there is a flight number, such as the notes app or mail. It doesn’t work for Amtrak, though. What flights does Amtrak have? Louis beat me to the iOS as well revelation. Not all airlines appear to be supported e.g. Air New Zealand’s flight NZ1 doesn’t trigger the behaviour. Thanx a lot for pointing out this one!